Jeremy Bentham (February 15, 1748 - June 6, 1832), jurist, philosopher, legal and social reformer, and English gentleman, is best known as an early advocate of utilitarianism. He was a political radical and a leading theorist for Anglo-American philosophy of law, and influenced the development of liberalism. Bentham was one of the most influential utilitarians, partially through his writings but particularly through his students all around the world, including James Mill, his secretary and collaborator on the utilitarian school of philosophy; James Mill's son, John Stuart Mill; a number of political leaders; Herbert Spencer; and Robert Owen, who later developed the idea of socialism. Bentham argued in favor of individual and economic freedom, including the separation of church and state, freedom of expression, equal rights for women, animal rights, the end of slavery, the abolition of physical punishment (including that of children), the right to divorce, free trade, and no restrictions on interest rates. He supported inheritance tax, restrictions on monopoly power, pensions, and health insurance. Bentham also coined a number of terms used in contemporary economics, such as "international," "maximize," "minimize," and "codification." Bentham was born in 1748, in Spitalfields, London, into a wealthy Tory family. His father and grandfather were lawyers in the city of London, and his father intended for him to follow and surpass them as a practicing lawyer. Several stories illustrate his talents as a child prodigy: As a toddler, he was found sitting at his father's desk reading a multi-volume history of England; he was an avid reader, and began his study of Latin when he was three. At Westminster School he won a reputation for writing Latin and Greek verse, and in 1760, his father sent him to Queen's College, Oxford, where he took his Bachelor's degree. In November of 1763, he entered Lincoln’s Inn to study law and took his seat as a student in the King’s Bench division of the High Court, where he listened with great interest to the judgments of Chief Justice Lord Mansfield. In December 1763, he heard Sir William Blackstone lecture at Oxford, but said that he detected the fallacies that underlay the grandiloquent language of the future judge. He took his Master's degree in 1766. He was trained as a lawyer and was called to the bar in 1769, but spent more time performing chemistry experiments and speculating on the theoretical aspects of legal abuses than reading law books. He became deeply frustrated with the complexity of the English legal code, which he termed the "Demon of Chicane." On being called to the bar, he bitterly disappointed his father, who had confidently looked forward to seeing him become lord chancellor, by practicing law. His first important publication, A Fragment on Government (1776), was a small part of his much larger Comment on the Commentaries of the jurist Blackstone, the classic statement of the conservative legal theory that was one of Bentham’s principal aversions. In 1785, Bentham traveled, by way of Italy and Constantinople, to Russia, to visit to his brother, Samuel Bentham, an engineer in the Russian armed forces; it was in Russia that he wrote his Defense of Usury (published 1785). Presented in the form of a series of letters from Russia, Bentham’s first essay on economics shows him to be a disciple of the economist Adam Smith, but one who argued that Smith did not follow the logic of his own principles. His main theoretical work, Introduction to the Principles of Morals and Legislation, appeared in 1780. Bentham corresponded with many influential people. Adam Smith opposed free interest rates until Bentham's arguments on the subject convinced him otherwise. Because of his correspondence with Mirabeau and other leaders of the French Revolution, he was declared an honorary citizen of France, though later he strongly criticized the violence that arose when the Jacobins took power in 1792. In 1791, Bentham published his proposal for a model prison building which he called the Panopticon, in which prisoners would be under continual observation by unseen guards. He approached both the French National Assembly and the British government about establishing such an institution, but the proposal was eventually abandoned. In 1813, however, the British Parliament voted to give him a large sum of money in compensation for his expenditures on the Panopticon scheme. Although the Panopticon was never built, the idea had an important influence on later generations of prison reformers. After 1808, James Mill became Bentham’s disciple and began to help propagate his doctrine. His Catechism of Parliamentary Reform, written in 1809, was published in 1817. Chrerstomathia, a series of papers on education, appeared in 1816, and in the following year, James Mill published his edition of Bentham’s Table of the Springs of Action, an analysis of various pains and pleasures as incentives for action. In 1823, Bentham and John Stuart Mill co-founded the Westminster Review as a journal for philosophical radicals. Bentham is frequently associated with the foundation of the University of London, specifically University College London, though in fact he was seventy-eight years old when it opened in 1826, and played no active part in its establishment. However, he strongly believed that education should be more widely available, particularly to those who were not wealthy or who did not belong to the established church, both of which were required of students by Oxford and Cambridge. As University College London was the first English university to admit all, regardless of race, creed, or political belief, it was largely consistent with Bentham's vision, and he oversaw the appointment of one of his pupils, John Austin, as the first Professor of Jurisprudence in 1829. It is likely that without his inspiration, University College London would not have been created when it was. On his death, Bentham left the school a large endowment. 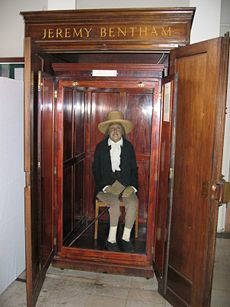 As requested in Bentham’s will, his body was preserved and stored in a wooden cabinet, termed his "Auto-Icon," at University College London. It has occasionally been brought out of storage for meetings of the Council (at which Bentham is listed on the roll as "present but not voting") and at official functions so that his eccentric presence can live on. The Auto-Icon has always had a wax head, as Bentham's head was badly damaged in the preservation process. The real head was displayed in the same case for many years, but became the target of repeated student pranks including being stolen on more than one occasion. It is now securely locked away. There is a plaque on Queen Anne's Gate, Westminster, commemorating the house where Bentham lived, which at the time was called Queen's Square Place. 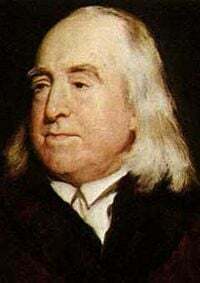 Bentham believed that many social and political ills in England were due to an antiquated legal system, and to the fact that economy was in the hands of a hereditary landed gentry which resisted modernization. He rejected many of the concepts of traditional political philosophy, such as “natural rights,” state of nature, and “social contract,” and worked to construct positive alternatives. He emphasized the use of reason over custom and tradition in legal matters, and insisted on clarity and the use of precise terminology. Many traditional legal terms, he said, such as “power,” “possession,” and “right,” were “legal fictions” which should be eliminated or replaced with terminology more appropriate to the specific circumstances in which they were to be used. In 1776, Bentham anonymously published his Fragment on Government, a criticism of Blackstone's Commentaries, disagreeing, among other things, with Blackstone's espousal of natural rights. Introduction to Principles of Morals and Legislation was published in 1780. Other works included, Panopticon, in which he suggested improvements in prison discipline, Discourse on Civil and Penal Legislation (1802), Punishments and Rewards (1811), Parliamentary Reform Catechism (1817), and A Treatise on Judicial Evidence (1825). John Bowring, a British politician who had been Bentham's trusted friend, was appointed his literary executor and charged with the task of preparing a collected edition of his works. This appeared in eleven volumes in 1843. Bentham defined liberty as “freedom from restraint.” He rejected the traditional concept that “natural law,” or “natural rights,” existed, saying that there was no time when people did not exist within a society and did not have some kind of restrictions imposed on them. He defined law as simply a command expressing the will of a sovereign, and rights as created by law. Laws and rights could not exist without government to enforce them. If there were a “right” which everyone exercised freely, without any kind of restraint, anarchy would result. These ideas were especially developed in his Anarchical Fallacies (a criticism of the declarations of rights issued in France during the French Revolution, written between 1791 and 1795, but not published until 1816, in French). Bentham recognized that laws were necessary to maintain social order and well-being, and that law and government could play a positive role in society. Good government required good laws, and a government chosen by the people which created laws to protect their economic and personal goods was in the interest of the individual. Bentham is the first and perhaps the greatest of the "philosophical radicals"; not only did he propose many legal and social reforms, but he also devised moral principles on which they should be based. His idea of Utilitarianism was based on the concept of psychological hedonism, the idea that pleasure and pain were the motivation for all human action, and psychological egoism, the view that every individual exhibits a natural, rational self-interest. Bentham argued that the right act or policy was that which would cause "the greatest happiness for the greatest number." This phrase is often attributed to Bentham, but he credited Joseph Priestley for the idea of the greatest happiness principle: "Priestley was the first (unless it was Beccaria) who taught my lips to pronounce this sacred truth: That the greatest happiness of the greatest number is the foundation of morals and legislation." Bentham also suggested a procedure to mechanically assess the moral status of any action, which he called the "Hedonic calculus" or "felicific calculus." Utilitarianism was revised and expanded by Bentham's student, John Stuart Mill. In Mill's hands, "Benthamism" became a major element in the liberal conception of state policy objectives. It is often said that Bentham's theory, unlike Mill's, lacks a principle of fairness embodied in its conception of justice. Thus, some critics object, it would be moral, for example, to torture one person if this would produce an amount of happiness in other people outweighing the unhappiness of the tortured individual. However, Bentham assigned to law the role of defining inviolable rights which would protect the well-being of the individual. Rights protected by law provide security, a precondition for the formation of expectations. As the hedonic calculus shows "expectation utilities" to be much higher than natural ones, it follows that Bentham did not favor the sacrifice of a few to the benefit of the many. Bentham’s perspectives on monetary economics were different from those of Ricardo. Bentham focused on monetary expansion as a means to full employment. He was also aware of the relevance of forced saving, propensity to consume, the saving-investment relationship and other matters which form the content of modern income and employment analysis. His monetary view was close to the fundamental concepts employed in his model of utilitarian decision making. Bentham stated that pleasures and pains can be ranked according to their value or “dimension” such as intensity, duration, and certainty of a pleasure or a pain. He was concerned with maxima and minima of pleasures and pains, and they set a precedent for the future employment of the maximization principle in the economics of the consumer, the firm and in the search for an optimum in welfare economics. ↑ Jeremy Bentham, The Works of Jeremy Bentham: Published under the Superintendence of His Executor, John Bowring, Vol X, (Adamant Media Corporation, 2001, ISBN 978-1402163838), 142. Plamenatz, John. The English Utilitarians. Oxford: Oxford Unversity Press, 1949. Jeremy Bentham's Life and Impact. Jeremy Bentham (1748—1832)—The Internet Encyclopedia of Philosophy. This page was last modified on 3 May 2018, at 23:56.